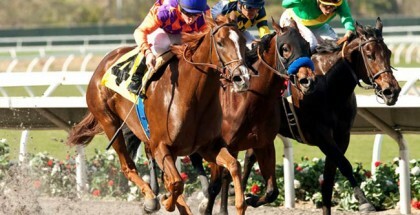 Frank E. Kilroe Mile 2015 Picks and Plays: Santa Anita Park launches racing this Saturday, March 7, 2015, with quite a stellar lineup of stakes races. Top billing in the day’s card goes to the $1,000,000 Santa Anita Handicap with Shared Belief looking to steal the show. However, I’m going to take a closer look at the Frank E. Kilroe Mile Stakes. 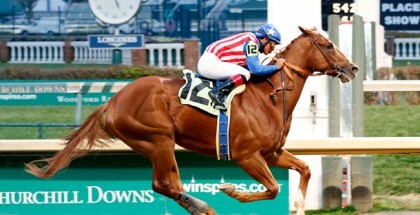 This race is for four-year-olds and up at a mile on the turf and offers a purse of $400,000 to the top finishers. The race was inaugurated in 1960 and was named for Frank E. (Jimmy) Kilroe. The race’s namesake was a top-notch California racing guru who led Southern California racing into the limelight during the 1970s. Kilroe retired from Santa Anita in 1990 where he had served as Racing Secretary since 1950 before taking on the responsibilities of Senior Vice President for racing in 1982. The leading Santa Anita figure passed away in 1996 at 84 years of age. We have to look back to 2009 at one of the top turf racers, Gio Ponti from the barn of trainer Clement, to find an American-bred (Kentucky) winner of this race. The past five editions of the race have been won by horses bred in other countries: Argentinian-bred victors Winning Prize (2014) and Suggestive Boy (2013), Irish winner Willyconker (2012), Brazilian-bred champion Fluke (2011), and sole female winner bred in Great Britain Proviso (2010). Last year, Winning Prize, from the barn of Neil Drysdale with Corey Nakatani in the irons, won this race gate-to-wire at odds of 7/2. However, he didn’t do it very easily. He had Tom’s Tribute pressing the pace for a ways before fading. 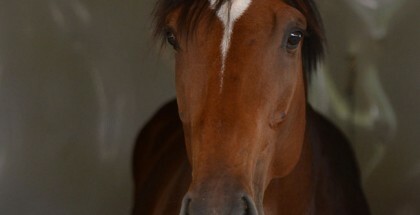 Suggestive Boy, who won the year prior, sat in the garden spot to steal third, nudging out Za Approval. Lochte gave Winning Prize everything he had at the top of the stretch but just couldn’t nail him. The 2015 Frank E. Kilroe Mile has a start time of 4:30 p.m. PST and is the tenth race of the day on a card of eleven. The Kilroe is sandwiched between Race 9, the San Carlos Stakes (GII), and Race 11, the Santa Anita Handicap (GI). We have a full field of twelve entering the starting gate this Saturday. The defending champion Winning Prize merits consideration to steal the show again. I like his odds of hitting the board, but I’m not so sure about his chances of winning. So, let’s take a look at my top picks. I’m going with Summer Front as my steal-the-show guy. Last time out, the Christophe Clement-trained son of War Front was fourth in the 2014 Breeders’ Cup Mile on November 1. This six-year-old claims the most class of this field in regards to past performances. He was a sharp second 3 races in a row prior to the Breeders’ Cup finish, and without Obviously plus a few other turf stars he has faced, he gets top respect from me. He has beaten Winning Prize and Silentio who are both entering here off layoffs as well. Summer Front gets Victor Espinoza in the irons, has the top speed figures of the field at this distance, and was actually only beaten by a little over two lengths for that fourth-place finish in the Breeders’ Cup. He has won off of a four-month layoff before, albeit two years ago, after coming back from a layoff that lasted from April 2013 until August 2013. Can he repeat that feat? The six-year-old son of Pure Prize Winning Prize is coming off two sixth-place finishes last summer in the Grade I Shoemaker Mile, beaten by Obviously, Summer Front, and Silentio in the top three. 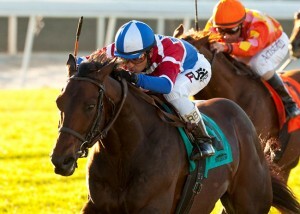 He followed that up with another sixth-place finish in the Play the King Stakes (GII) at Woodbine. He’s had some rest, and I never underestimate Neil Drysdale’s ability to pull off a huge win. He gets top meet rider Bejarano in place of Nakatani, so that is a plus for me. 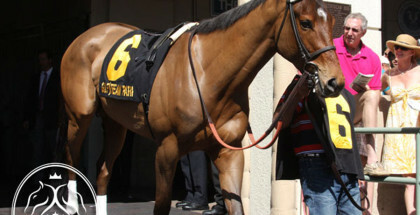 He carries the highweight of the race with 120 pounds and gets a nice inside post position. He will probably try to go gate-to-wire again which will be interesting as he’s parked inside Holy Lute who has won his past two races sprinting on this track in the same fashion. Speed kills, so Winning Prize certainly won’t achieve victory easily. Za Approval is running for the third time for the Mark Casse barn. I have two issues with him. The first is his assigned outside post position 11, and the other is that he is 0-for-8 in graded stakes company since winning the Grade III Knickerbocker in 2013 at Belmont. He was out-finished for fourth in this race last year, but I do have a lot of faith in Casse who has been on fire lately at this meet. He was ridden by east coast jockey Rosario for the Clement barn last year, but he now gets a leading west coast jockey in Mike Smith who rode him last time out in the Grade II Arcadia on January 31. In that mile outing he finished second to Avanzare who is skipping this race. I definitely think he’ll land in the money – in which slot is the question. Silentio also gets a nod from me. He was last seen finishing fourteenth in the Breeders’ Cup Turf Sprint last November where he was squeezed at the start. However, trainer Gary Mandella maintains the utmost confidence in this horse and has stated that he’s done well off a long layoff before. He was second by a nose in the 2013 edition of this race, but with rider Flavian Prat in the irons, he could make some noise. Silentio may be worth using in the bottom of exactas and trifectas as he usually manages to come in the money. Can he make his 2015 start a winning one? Plays: The only solid play I have right now is a Daily Double with Race #9 with the #1 Chitu. So, I’ll do a $2 DD R9: 1/8,3,11, and I may toss the #6 Silentio into that mix. It really depends on the odds. If I make any other wagers, I will tweet them the day of the race. Best of luck to everyone Saturday, and may all run safely.